Another from a number of interesting period photos which was a glass negative sent to us by Alun Pugh of Leeds (UK) " Can you please identify this vehicle outside the Royal Clarence Hotel with a reg. plate of Y99.Somerset I believe?" -- Indeed Somerset County Council registration. The car is a British built cca 1897 Daimler 6.5 Wagonette originally owned by G H Pruen who used it to transport guests from the railway station to his Royal Clarence Hotel in Burnham on Sea, Somerset. The Car is around today and is now at The Haynes Motor Museum in Yeovil. We have slightly repaired and toned the photo. This photo is undated but from the hat and clothes worn by the driver, it must have been taken in relatively modern times. With no other background on the photo, we decided to do a bit of research. From the shape of the bonnet, the tie rod and dumbirons, the car would seem to be a turn of the century Daimler; unusual air cooled radiator at the front. Registration Y 99 does not help greatly because registrations were not introduced in Somerset until December 1903. All cars already in road use were registered first, so there were at least 99 cars already in the area ahead of it. Daimler history at their beginning was relatively complicated. Daimler Motoren Gesellschaft was started in Germany in 1890 by Gottlieb Daimler and Wilhelm Maybach in the Stuttgart district of Cannstatt. Original plans were to build engines but success with race cars built to order for Emil Jellinek started producing in 1902 of the 'Mercedes' car, named after Jellinek's daughter. 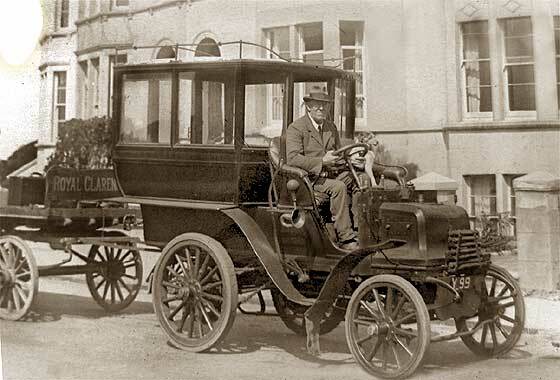 Also made commercial vehicles from 1897 which were successful in the UK. In 1890 an engineering friend of Gottlieb Daimler, Fredrick Simms, returned to the UK with one of Daimler's Phoenix engines and eventually took over the Daimler Patents for the UK forming the Daimler Motor Syndicate Co. He would receive 10% commission on all British sales of Daimler-powered Panhard & Levassor cars. First UK designed/made car left factory in 1897. UK Daimlers had a twin-cylinder, 1526 cc engine, mounted at the front of the car. In 1895 a British promoter Harry Lawson went round buying up all manor of motor patents to make money by licensing of the same. He bought the UK Daimler patents and floated the Daimler Motor Co in premises of a old disused Coventry Cotton Co cotton mill in Coventry which he renamed the 'Motor Mills'. Thus there were now two separate largely unconnected Daimler Companies, one in Germany and one in England. However Lawson reformed the Daimler Motor Syndicate into British Motor Syndicate, with Dainler Motor Co paying them Royalties. Various infringement cases ensued which the British Motor Syndicate initially won. This however stated to go wrong in 1904 and Lawson was eventually imprisoned for fraud. Daimler UK in the meantime had been making their own cars and making licensed Leon Bollee cars. Disagreements with Cannstatt resulted in Gottlieb Daimler leaving the UK board, and resulted in a massive reshuffle of directors. All this caused Daimler UK to have major financial problems in 1904 and company was closed down, reorganised, and restarted. Few years later in 1910 it was purchased by BSA (Birmingham Small Arms). Lord Montagu of Beaulieu had a Daimler in 1900 and gave The Prince of Wales a ride in it. The Prince then bought a Phaeton and later another. As King Edward VII he then gave Daimler the Royal Warrant to provide vehicles to the Royal Family. Every British monarch since has been driven in Daimler limousines. In 1950, after a persistent transmission failures on the King's Daimler car, Rolls-Royce was asked to provide official state cars. The current official state car is a purpose made Bentley. So what about this car? It is photographed above towing a trailer with the name of Royal Clarence Hotel. Research on the Royal Clarence in Somerset places it in Burnham on Sea. It seems it was an old coaching inn from about 1792. Originally on the head of a causeway, it was swept away by the floods a number of times during its construction. In 1836 it is mentioned that the hotel is going to be 're-opened'. In 1903 the hotel is reported as having a 'motor pit' and a motor car for hire. Also mentioned is that the landlord at the time, George Pruen, had a 1898 Daimler Wagonette registration Y 99 in which he used to collect customers from the railway station. It used to backfire loudly and frequently and hence got the name locally as 'Fiery Liz'! It is said it was made at the Motor Mills in Coventry, costing �373 (equivalent of about �45,000). It seems it served as a School Bus for a while. Digging further advises that the car has been used as a Wedding Car in the 1903 wedding of of James Andrews and Rosa Gough. This would make it one of the earliest 'wedding cars'. At that time the car is pictured as an open Wagonnette and not having the closed body as shown on the above photo. It seems the enclosed weatherproof rear body was added later, possibly 1920+. The car remained in constant use until about 1929 by which time it was said to have covered 500,000 miles. It was driven to the Bristol Museum in 1947 where it seems to have stayed until the museum passed it on to the The Haynes Motor Museum in Yeovil, Somerset. The museum's curatorial director, said: 'When the car first arrived we knew that it was one of the very first motor cars to be used in Somerset and that it had previously been owned by a Mr G H Pruen from Burnham-on-Sea." From current photographs of the car, it seems the enclosed body has been removed and that a wagonette body has been returned. It also has modified mudguards and presumably other changes which have occurred over the last 100+years. Interesting to note that apparently the car is allowed to be used as a prop for wedding photographs, carrying on the tradition started in 1903 ! !